Knowing precisely what changes are set to occur when the upcoming General Data Protection Regulations come into effect on 25 May, and being fully prepared for them, are very different things. Customers may know what they need, or how to adapt, but it is the responsibility of dealers to take those solutions to the market and educate their customers accordingly. Earlier this year, the Office of the Data Protection Commissioner aimed to gauge the preparedness of 500 businesses in Ireland for the implementation of GDPR; the results showed that 67% of businesses had not assessed what data they held, and 57% had not asked themselves why they held it. Worryingly, only 69% had heard of GDPR, and 78% had not identified the steps required to become compliant. One potential stumbling block for businesses when GDPR kicks in is the right to be forgotten, which allows citizens to request to have all of their records deleted. Many companies, especially those which are still paper-based, may have years’ worth of out-of-date data taking up drawer space; information on old accounts, ex-employees, and other sensitive but now-defunct documentation can land a business in seriously hot water if not disposed of when necessary. Holding onto this information is no longer simply an issue of inadequate organisation – come May, there will be more serious legal implications for keeping data either beyond its expiry date or when disposal is requested. One of the strongest and most secure ways to become more structured with document management is to implement a robust digitalisation strategy. This may be a major change for some, but it should be thought of as not only a legal requirement, but a long-term step towards improved efficiency and productivity. Dealers should ensure customers know that this is a positive cultural change, one which embraces digital and may even take them back to a time of stronger, more mutually beneficial relationships with their own clients. It should also be noted that most document scanners include a software solution which allows the digitalised documents to be collected and organised ready for the user, making the process even simpler. Fujitsu in particular offers a broad range of services specifically designed to make life easier, from SOHO and SMB offices to large corporates. The print giant is a huge advocate of digitalisation and the promotion thereof, and aims to create solutions and services for dealers to take to those who need the support. For Fujitsu, digitalisation has endless benefits, including a more streamlined workflow, higher security, easy-to-follow digital ‘paper trails’, improved accessibility of data, and having all the necessary information coming from one source. Thanks to these advantages, digitalisation is a brilliant tool for improving GDPR compliance; archiving and disposal of data is made simpler and more efficient when the information is stored within one simple platform, and accessibility can be restricted as necessary. Lest we forget that another rule within GDPR is that citizens have the right to access any information about them that they wish to see, and companies will have to offer up that data within one month – this requires a great deal of organisation if the data is only in hard copy form, whereas with digitalisation, it’s only a few clicks away. Fujitsu has teamed up with some of the best software providers in the industry to help businesses efficiently compile their paper documents into one digital hub; this includes Fujitsu hardware for scanning and an EASY Software solution for document management. 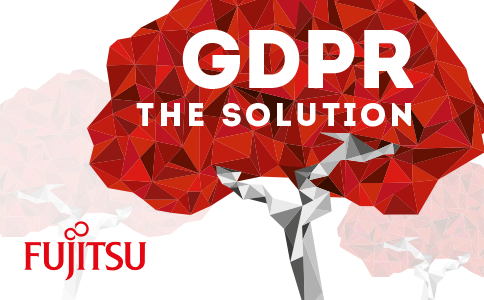 EASY Software allows customers to collate and assess information easily, and paired with Fujitsu hardware, dealers have a winning combination for GDPR compliance and vastly improved data management to sell to customers. Once documents are scanned into this system, the business using them has controlled access so that only those with permission can view them. The system includes an audit trail as standard, and as soon as a document is scanned in, data retention periods are set and tracked. In three months’ time the new legislation will be a reality, and non-compliance will not be tolerated. In 2016, TalkTalk was fined £400,000 for security failings; under GDPR rules, the same issue would incur a fine of £59m. Dealers should ensure they communicate that any fines incurred by non-compliance would certainly cripple an SMB, making the adoption of Fujitsu and EASY Software’s system is a clear choice. Fujitsu’s special promotions and its sales lead pipeline, making it a must-have for all dealers. Sign up for free at: www.imaging-channel-program.com.